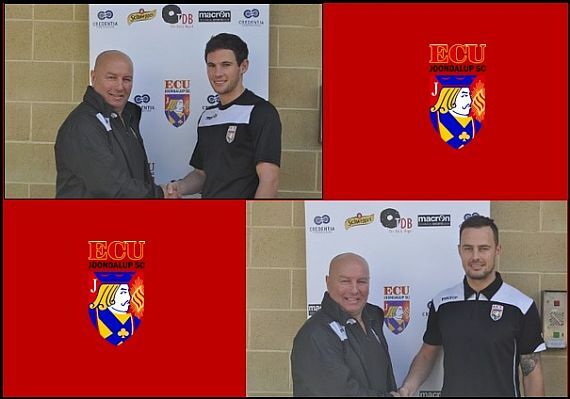 ECU Joondalup have re-signed import striker Gordon Smith and midfielder Kevin Moon on pro-contracts, after the pair was targeted by other NPL clubs. ECU President Steve Wheatley said both Moon and Smith have been outstanding and they moved quickly to secure their services. “Kevin had to bide his time when he first came over to the club, and we had to wait till the transfer window to sign him, but he has fitted in superbly, both on and off the pitch,” he said. “Googsy arrived in pre-season and has been outstanding, and has been a leader on the pitch and has scored goals, which is why we brought him here. Wheatley said the club are delighted to have secured the players on professional contracts. “We moved quickly to cross the T’s and dot the I’s, and were delighted to have signed them both on pro-contracts,” he said. Moon said there was only one place he wanted to be next season. “I’m delighted to have signed on again for next season. There is a real feel good factor at the club at the moment which we are looking to take into next season,” he said. Smith echoed the views of his Scottish team mate and said he’s happy to have signed and said there was interest form other clubs. “I’m delighted to stay another season as the club is on the up and have a very good side on and off the park,” he said. ECU Coach Dale McCulloch said Moon and Smith are an integral part of the clubs plans, and have both been outstanding. “We are delighted to have signed both players and all the others we’ve signed for next season,” he said. “We have worked extremely hard to get these players to our football club, we’ve done our homework, and the clubs committee have back us, and it’s paid massive dividends for us. “We have a great squad at the moment and we’ve re-signed eight and will be talking to the rest of the squad in the next few weeks to make sure we keep them together for next season.